New in SA, the GoofBoard™ is designed for surfers as a way to bring home the surf riding experience and return to waves the better for it. You’ll have a blast on the GoofBoard while sharpening your surfing skills along the way. There are two GoofBoard models to choose from - Classic or Freestyle. If you ride a longboard or SUP the Classic is for you. This board will also give the beginning surfer the most realistic ride. The Freestyle is ideal for short board surfers, wake surfers, and snowboarders. The basic motion of the GoofBoard Classic simulates trimming down the face of a small wave. 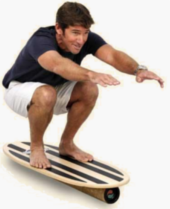 Given some time, riding the GoofBoard will absolutely advance your surfing skills and bring greater style fluidity with better strength, balance, and control. There is no better way to work on cross-stepping. Perfect for SUP! This might be the best way to gain your paddling balance and acclimatise your feet, ankle, and leg muscles . . . and the most fun way too! At first, the “Freestyle” may look similar to other balance boards, but not really. Notice the length of the pipe and stop locations which allow for safe rail-to-rail AND nose-to-tail riding…using only one pipe. And, notice what’s missing from the pipe…grip tape. The result is a loose feel for a truly “free” style. A super-secret pipe coating has a perfect grip/slip ratio...feeling more like riding a wave or on snow. More magic of the Freestyle is released if you become expert enough to ride without the stops. If you're up for it, remove the stops for a full range of crazed rotational tricks. But be careful, don’t remove the stops until you have mastered the thing with 'em. Ideal for short board surfers, wake surfers, and snowboarders. Check out more comments here. Copyright ©2013-2019 GoofBoard South Africa & GoofBoard Products, LLC. All Rights Reserved.